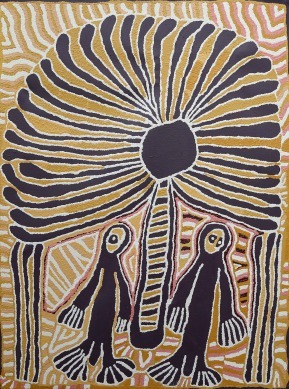 Desert Gold, the exhibition of small works from leading Central Desert Aboriginal artists, will be on display from 16 November to 22 December, 2012. It features artists who capture on canvas the burnished colours of the desert heartlands – some have gone a step further and added metallic lustre to their paintings. This shimmering group of works is presented by Aboriginal artists including Gloria Petyarre, Abie Loy Kemarre, Nellie Marks Nakamarra, Dorothy Napangardi, Yinarupa Gibson Nangala, Mary Dixon Nungurrayi , Thomas Tjapaltjarri and Anna Petyarre. Nellie Marks Nakamarra paints Water Dreaming, the significant Kapi Tjukurrpa, from the desert site at Kalipinypa, 500 km north-west of Alice Springs. A powerful storm site, it is associated with an important rain making ceremony to evoke the elements, to bring on lightning, thunderclouds and rain to rejuvenate the earth, and to fill the rock holes, claypans and creeks. This Tjukurrpa sweeps in from the west to its great centre, the large claypan at Kalipinypa, where lightning strikes proliferate and drive the storm clouds. Kalipinypa is at the western end of a chain of such Water Dreaming sites which run from west to east. Anmatyerre, Luritja and Pintupi share in this story line. Nellie Marks Nakamarra is a Luritja woman, stepdaughter of the famous Aboriginal artist Turkey Tolson, and younger sister of the artist Elizabeth Marks Nakamarra. Nellie was taught to paint by many of the founders of the Desert Art movement. Born in Papunya and growing up in the Western Desert, Nellie’s greatest artistic influences included Old Mick Namararri, Turkey Tolson and Uta Uta. 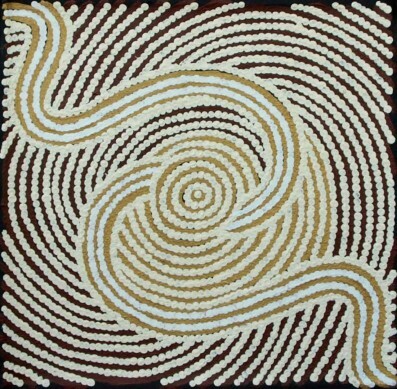 Mary Dixon Nungurrayi paints designs associated with traditional women’s ceremony, including body painting motifs and the woven hairstring adornments that are used in the ceremony. The women trace the designs onto their bodies, singing as each woman takes her turn to be ‘painted up’. Their songs relate to the Tjukurrpa Dreaming stories of ancestral Creation beings who travelled the country and brought into being all the features of the landscape and natural world. The women’s ceremony demonstrates respect for the land. In performing these ceremonies the women ensure well-being on their lands and within their communities. The women make woven ceremonial belts from hairstring, and then paint the ceremonial designs on their breasts, first with their fingers, and on their chests, and then with a brush made from a stick. They paint with red and white ochres. The older women ensure the passing on of the traditional knowledge to the younger women. These stories underpin the selection of small scale Aboriginal art works being shown in the current exhibition at Japingka Gallery, featuring over twenty Central Desert artists, on show until 22 December 2012.